Ali Carter says he can match Neil Robertson's "swagger" when they get their World Championship second-round match under way on Saturday afternoon. Robertson, the 2010 winner and world number number four, is confident about his Crucible chances and impressed during a crushing 10-2 first-round win over Welsh qualifier Jamie Jones. "When I am playing well I can swagger around the table as well," Carter said. "I'm looking forward to swaggering and no doubt so is he." Australian Robertson hit three tons and three half-centuries in beating Jones, including the highest break of the tournament so far - a 143. But two-time runner-up Carter, 35, looked in good form during a slick 10-5 win over Scotland's Alan McManus in his first-round match. The Chelmsford man, whose world ranking was protected while he twice fought cancer, told BBC Sport: "It's obviously a tough match but it's tough for him as well. "I am looking forward to getting out there and playing. I am in a good place. 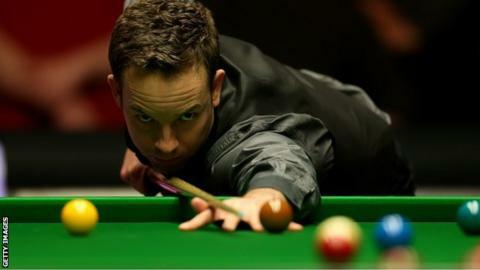 "Neil is is a great competitor and I am looking forward to sharing some Crucible time with him. "I know my way around Sheffield, I have played in every round, and I have won matches in every round - apart from the final. "I have made the a max here and I have pretty much been there, nearly done it and got the T-shirt. And wouldn't it be nice if this was my year?"